If you are one of the 30.3 million Americans with diabetes, you are at risk for diabetic eye disease—including blindness. Even worse—these conditions can sneak up, progress a long way without symptoms, and then catch you off guard. If this is news to you, don’t panic—just take note of the risks and know you can do something about them. 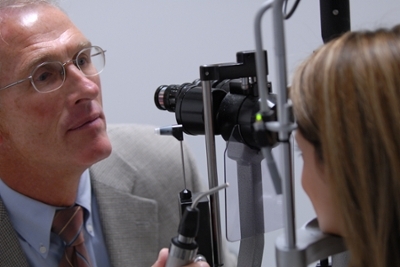 Early detection, timely treatment, and follow-up care may prevent vision loss. Diabetic eye disease is actually a group of complications associated with diabetes. They include diabetic retinopathy, cataract, and glaucoma. All of which can cause serious vision loss or even blindness. Uncontrolled or poorly controlled diabetes causes circulation problems that can damage the delicate blood vessels of the retina. In some cases, they may swell and leak fluid. In others, abnormal new blood vessels grow on the surface of the retina. These changes are dangerous, and yet in the beginning stages, you may not even know they’re taking place. There’s no pain, and your vision might not change until the disease becomes severe. Diabetic retinal damage can also lead to bleeding in the eye, scarring, high eye pressure (glaucoma), and even retinal detachment. Diabetic retinopathy or diabetic retinal damage is a leading cause of irreversible blindness worldwide. The permanent blurring of vision from cataracts (a clouding of the eye’s clear lens) can also result from changes to the lens due to excess blood sugar. Make sure to work with your primary care physician or an endocrinologist to manage your disease. Keep your blood sugar in the target range by eating a diet low in sugar and other simple carbs, exercising regularly and checking your blood sugar often. Cook at home using fresh ingredients. That’s the best way to avoid hidden sugars and high-fat foods. Avoid eating too much red meat and eat your vegetables. Stay away from fried foods, refined carbohydrates, and sugary beverages. Plain or naturally flavored water is your friend! Control your blood pressure. This is key in protecting your eyes from diabetic retinopathy. Get an annual—or more often if needed—dilated eye exam. If you have vision problems such as “floaters” that don’t go away or blurry vision, see an ophthalmologist immediately. Always take your insulin or medications as prescribed. What Kinds of Treatments May Help if You Have Eye Damage From Diabetes? Your ophthalmologist can perform laser procedures to stop the progression of retinal disease and reduce swelling. Medications may also be injected straight into the eye to help reduce swelling. Surgery is a later resort to clear out blood and remove scar tissue that may be causing the retina to swell or detach. Learn more about diabetic eye disease symptoms, detection, and treatments here.